I don’t do much Asian cooking, so this may be the start of something new. I wanted to try my hand with Pad Thai, my usual from Pei Wei. Being a novice, I bought two kinds of rice noodles from my local Asian market – a precooked package from the refrigerator case and a package of dried. I followed the directions below with the dried noodles and worried that they were too al dente after the soaking time, so I opened the precooked package. After pinching off a bit a precooked noodle, I opted to take my chances with the dry noodles – the precooked had no flavor and the texture seemed mushy. I shouldn’t have worried. The dry noodles continued to hydrate during cooking and absorbed the flavor of the sauce – definitely the way to go. Soak the noodles in cold water for 15 minutes. Drain; cover with hot water. Soak for 15 more minutes. Drain; rinse in cold water. Heat oil in a large skillet over medium heat, add onion and cook, stirring, until translucent. 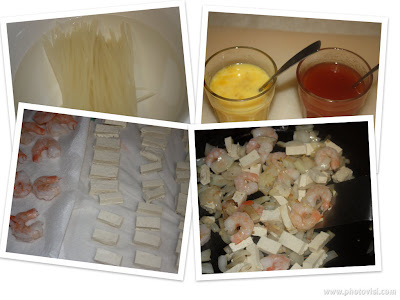 Add garlic, shrimp and tofu; cook until shrimp is pink. Add eggs, stirring until set. Whisk together ketchup, fish sauce, sugar, lemon juice, and vinegar; add to pan. Add noodles, bean sprouts, peanuts, and cilantro. Cover, cook until noodles are tender, about 5 minutes. Looks good! Looks just like the ones i ate in Bangkok! Thanks, Faithy, that’s good to know!